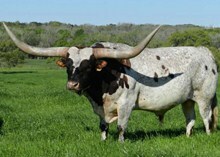 Double N Cattle Company is a top breeder of purebred Longhorn cattle in Muenster, TX. We breed and raise Texas Longhorns with the breed's historical genetics in mind. We have many longhorn bulls for sire, but to get the horn, color, and conformation, we favor in our cattle; we breed heavily from the following bulls.